Federal spending is projected to slowly increase over the next 25 years from 20.4 percent of GDP in 2014 to 25.9 percent of GDP in 2039. Federal revenue collections is expected to increase over the same timeframe, from 17.6 percent of GDP in 2014 to 19.4 percent of GDP in 2039. Over the same timeframe, marginal effective tax rates on labor are projected to increase from 29 percent to 34 percent and marginal effective tax rates on capital are projected to increase from 18 percent to 19 percent. Federal spending will increase more rapidly than federal revenues, which will increase the budget deficit. The federal debt held by the public has doubled since 2008, due to large deficits in the aftermath of the recession. 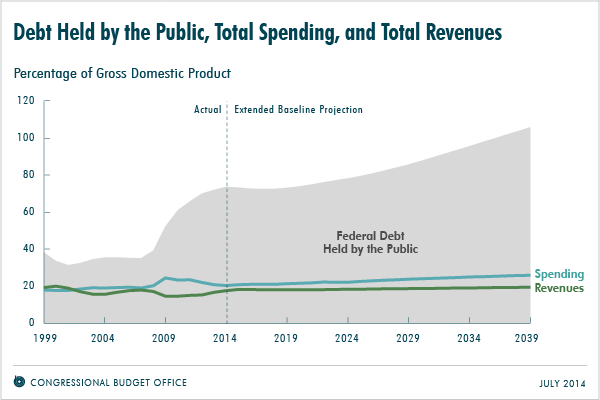 Federal debt held by the public is project to exceed 100 percent of GDP in the next 25 years.